Lately the kids have been sleeping in until 7:15/7:30am which is great because that means I too have been sleeping in. But trying to get all three of us fed, dressed and out the door by 8am can be tough. 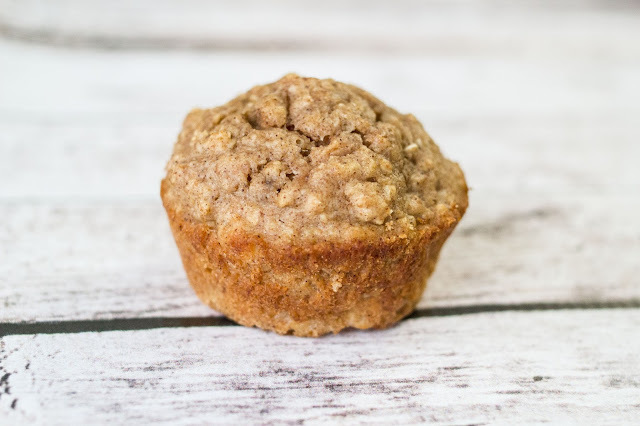 These muffins have been making my mornings easier. I make a big batch once or twice a month and freeze them. Then each morning, I zap them in the microwave, dice a banana, pour some milk and breakfast is served. 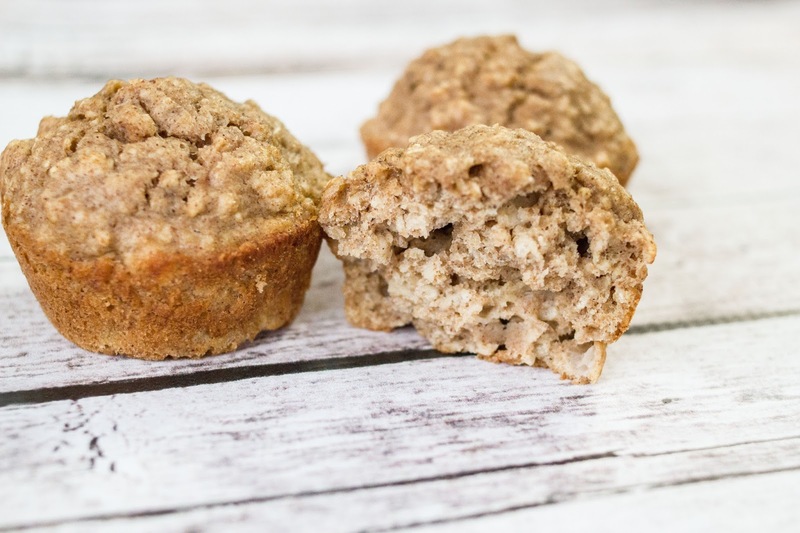 Both kids love these muffins and they make those mornings when everyone gets a little extra sleep much easier. 1. Mix the egg, oats, applesauce, cinnamon, baking powder and soda together. 2. Add the yogurt and mix well. 3. Stir in the flour. 4. Finally, stir in the apple and raisins until just combined. 5. Bake for 15-20 minutes at 350F. And we ate through pretty much everything we grew as it was harvested. But in the end we were able to grow a good amount of food. We had an over abundance of pickling cucumbers and my pantry is still stocked with jars upon jars of all different kinds of pickles. I also canned tomato sauce for the first time. Which leads us to this year's garden. I want more tomato plants. And more corn. And potatoes. So, we are going to go bigger (and hopefully better?) with the garden and till a plot for the garden. It actually will probably stay in the same spot, since it works well. We plan on tilling a roughly 30' x 35' plot. Marigolds/Nasturtium/Calendula/Petunia: Surrounding the garden as best as possible. I ordered seeds recently so in the next few weeks, I will be starting some inside. I hate to the wish the week away, but its February, we have about a foot of snow and have been without hot water and a furnace since last Friday. So, yeah, I am wishing to forget most of this past week and focus on only being cold for a few more days. 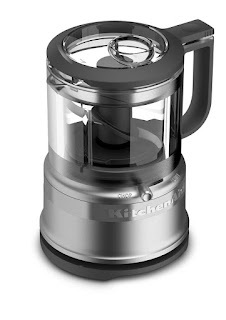 This week, I thought I would share 5 kitchen gadgets that I am loving right now. 1. KitchenAid Mini Food Processor - I bought this with some extra Christmas money last month and it has been instant love every since. I have a big ole regular food processor from when we got married 10+ years ago, that I have been using and its been fine. But to chop just a couple cups it's a lot of clean up. I saw this small food processor and was instantly sold. It works perfecting for small amounts and the clean up is fairly simple as it is only 3 pieces total. 2. 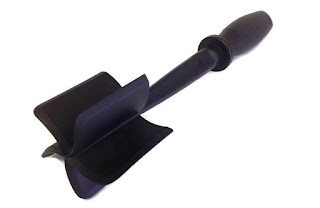 Ground Beef Chopping Spatula - I may be really late to the game with this one but how did I never know something like this existed. I have always used a wooden spatula to break up ground meat while it was cooking. This spatula works much better and makes nice small little pieces. 3. 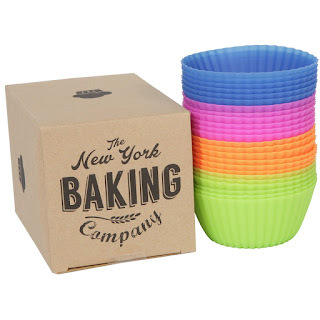 Reusable Muffin/Cupcake Cups - I have been using reusable muffin cups for year. I used to use square ones to make bento style lunches for Reid when he was in daycare years ago. Now, I use them for a lot of dessert muffins and such. 4. 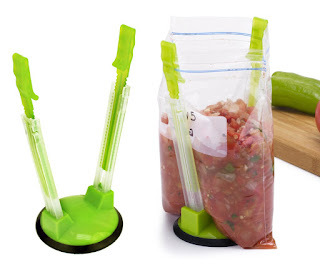 Ziplock Bag Holder - This has been another, how didn't I know about that, item. I have been using this ziplock bag holder at least weekly since I bought it last fall. I try to make a batch of soup/chili weekly and then will portion the leftovers into quart freezer bags before freezing them flat for lunches. 5. Scoop Strainer - I make the kids frozen veggies for lunches. 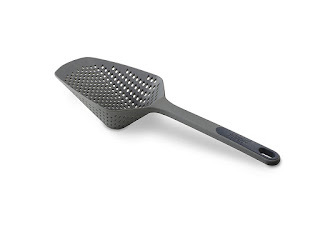 Which means that I was using either a slotted spoon or a large colander pretty much daily. Now I just pour, strain and distribute without adding bulk to the dirty dish pile. We have just recently entered the evening activity phase around here. Before now we had afternoon swim lessons but were still home well before mealtimes. Now between swim lessons, gymnastics and soon to be t-ball, we have evening activities a couple nights a week. Some days it feels like we spend all day in the car. I am mostly good at being prepared for anything with the baby... Diapers, wipe, food pouches, bib, extra set of clothes, etc. 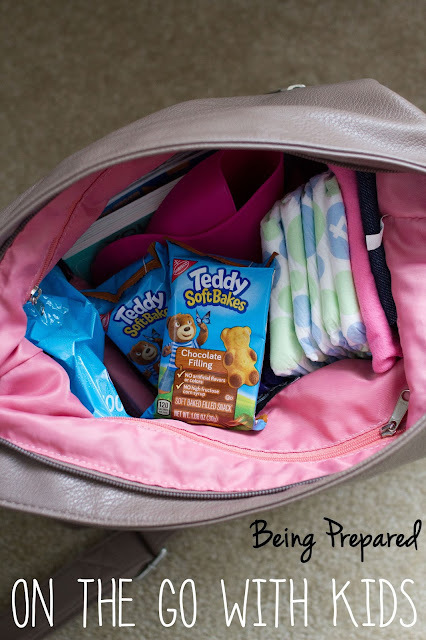 The diaper bag has it all. But with Reid being involved in more activities and being more active outside the house, when he gets in the car there have been a few hunger fueled 5-year-old meltdowns. I try to keep a few snacks in the car but am always looking for more. 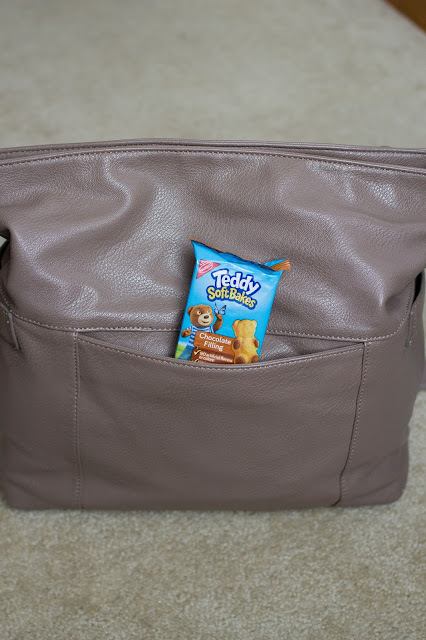 Recently we tried the new TEDDY SOFT BAKED Filled Snacks that I picked up at Walmart and now I have a new go-to snack to help prevent some tears and fill some bellies. 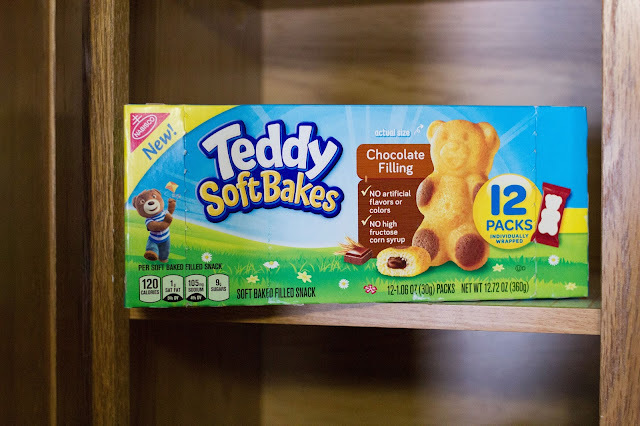 I love that the TEDDY SOFT BAKED Filled Snacks have no high fructose corn syrup, no artificial flavors or no artificial colors and are easy to find in the cookie/cracker aisle. 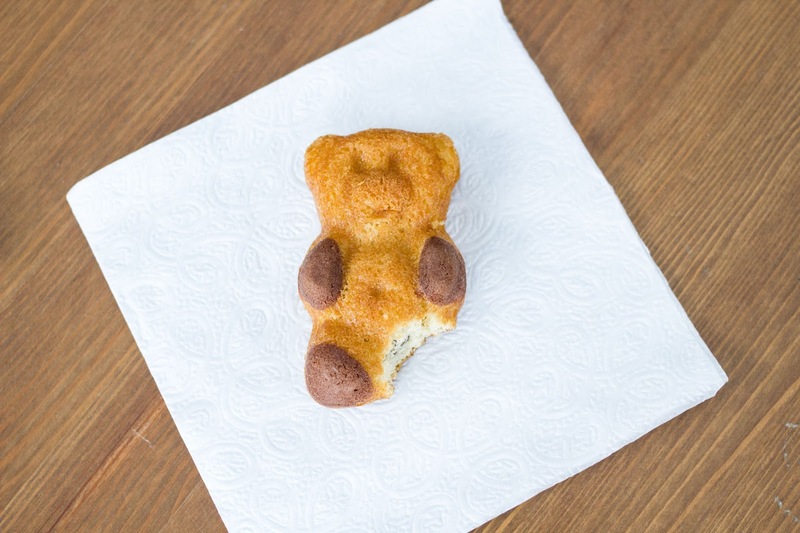 Of course the lovable bear-shape made them a lot of fun to eat. Cute Story: When I was taking these pictures and the kids were coloring on the floor in the dining room, the UPS guy knocked on our door. I just took the picture above with the whole TEDDY SOFT BAKED Filled Snack on the napkin and when I came back from the door, I saw this below... I asked Reid what happened and he blamed it on his little sister. Upon further questioning, he admitted that it probably fell down while skiing and broke his leg. 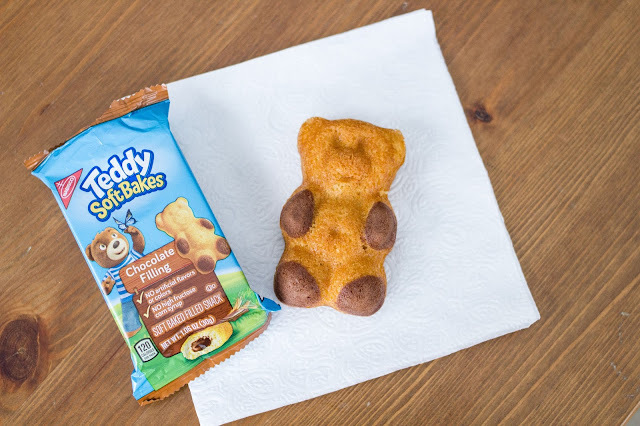 So head over the Walmart and pick up a package of the new TEDDY SOFT BAKED Filled Snacks for on the go (or at home!). On 2/23 there will be an in-store demo, as Teddy Grahams has partnered with GoGo Squeeze and the PRD display. Also, you can earn cash back with the free Ibotta app on the purchase of TEDDY SOFT BAKED Filled Snacks. So moms always be prepared! This recipe gets made almost monthly as these muffins make for a perfect addition to breakfast or lunch. I usually keep a couple out and then freeze the last dozen and use them throughout the month. 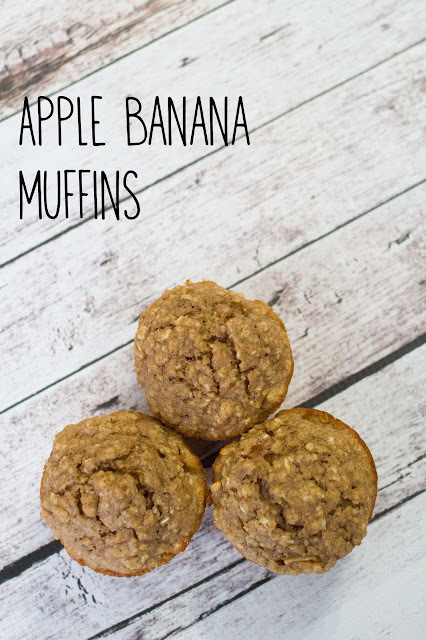 Both kids and us adults enjoy these Apple Banana Muffins. 2. 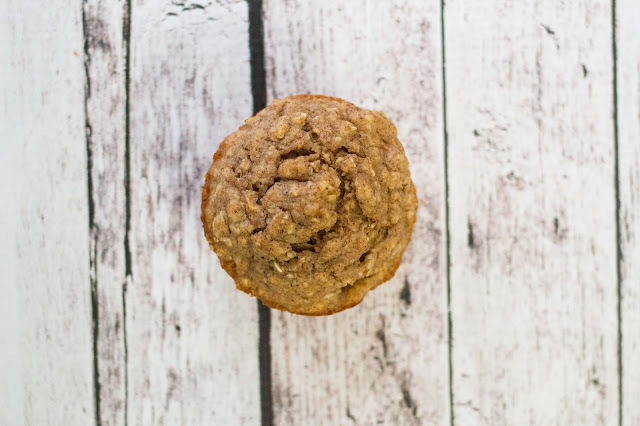 Mix the oats, flour, baking powder, cinnamon and nutmeg together and set aside. 3. Beat the eggs, applesauce and sugar together. 4. Add the milk and mix until combined. 5. Mix the dry ingredients until full mixed. 6. 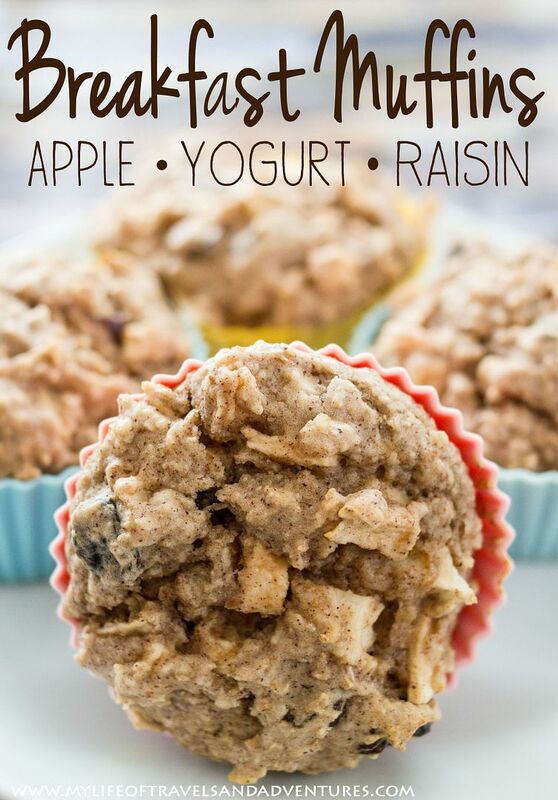 Add the mashed banana and apple and mix to combine. 7. 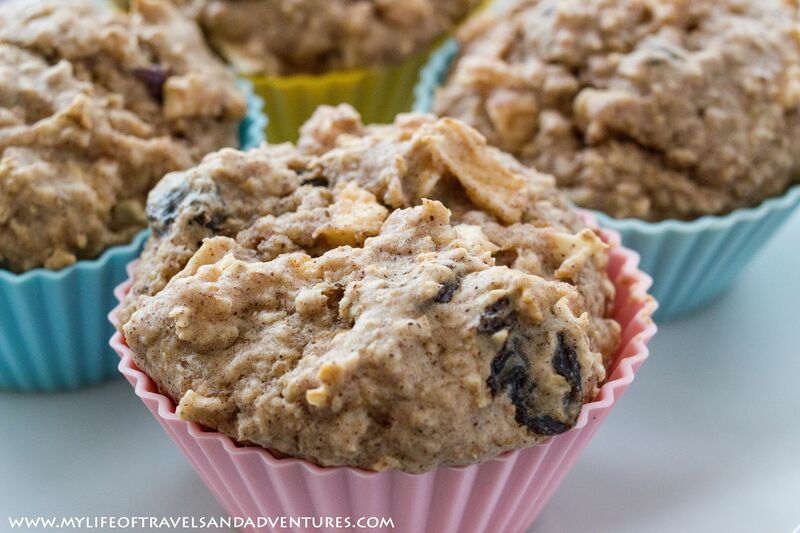 Add the mixture to greased muffin tins. Bake at 350F for 25 minutes. Once cooled these can be frozen. I place them on a cookie sheet lined with wax paper and freeze. Once frozen, store in gallon zip lock bags. Welcome to Friday's random assortment of favorites. I love instagram. It is definitely my favorite social media outlet. I am a big time picture person. That being said I share a lot of pictures of my kids and our little piece of the country on instagram. This is one of my favorite pictures of the past couple weeks. The evening before, I made + canned the last of our apples, so I brought the apple peels and such to the horses the next day. It just happened to be snowing at a decent rate and I was able to snap this pretty picture. I feel like we have a very good sized home library of kids books and this past year it has seemed that we have read all of our books on repeat. Granted we do hit up the library for books every couple weeks too but both Neil + me were looking for something different to read to Reid. We stumbled upon the My Weird School chapter books and they have been a hit ever since. We are slowly making our way through the set 1-2 chapters a night. I am still on a soup kick. 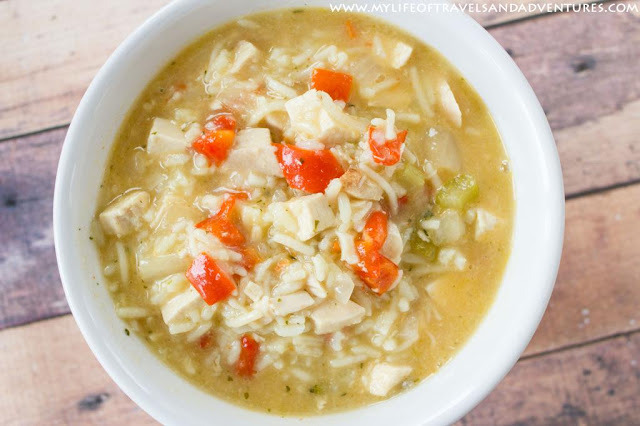 Its been so cold outside and nothing sounds better to me on a bitter cold winter day than soup (Well maybe not having to go outside on such a day). This week I made Chicken + Rice Soup and it really hit the spot. 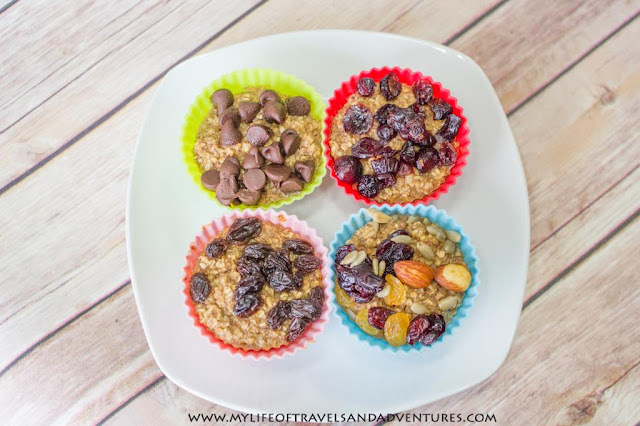 I also made a batch of these Baked Oatmeal Cups. Of course Reid wanted all the ones with chocolate chips. 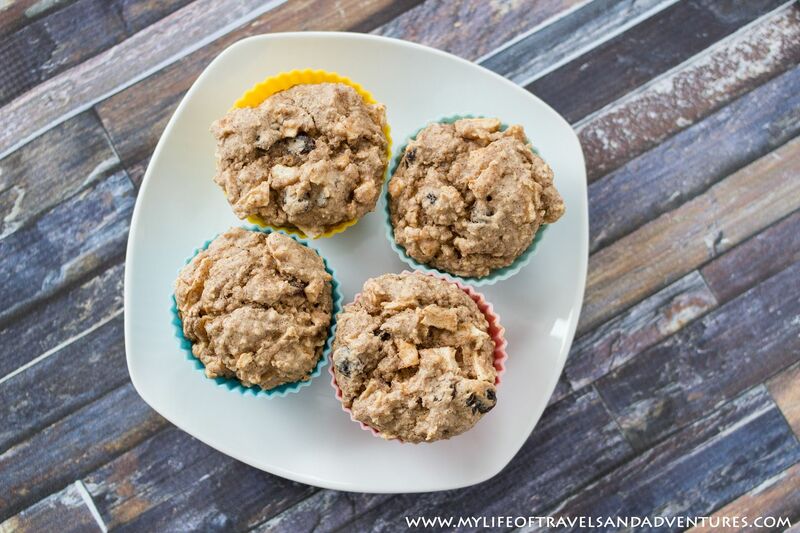 We have had a few for breakfasts this week and I popped the rest in the freezer for a quick breakfast or snack. It has been cold here (Hello, its winter), so I have been sipping a lot of hot chocolate lately. 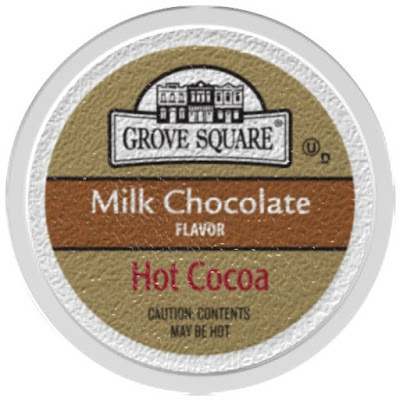 This Grove Square Hot Cocoa is my favorite. 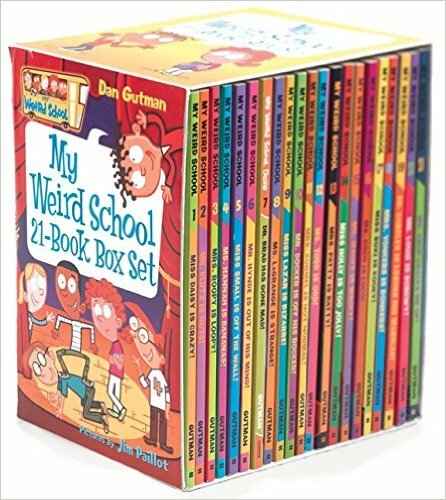 Thank goodness for Amazon Prime because its been going fast at our house. In the spirit of the new year organizing trend, I have been cleaning and organizing closets and forgotten spaces. 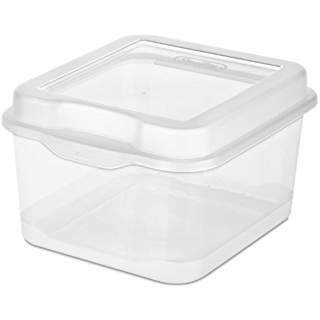 I have been using these Sterilite Flip Top storage boxes in several sizes to help organize and contain games in the playroom, medicine and bandaids in the closet, little craft items in the office, etc. 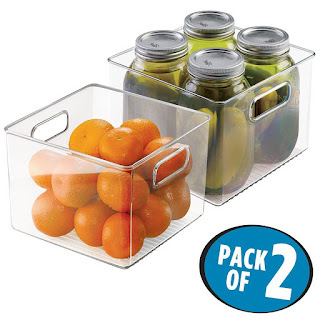 I love that the lid stays attached so I don't have to search for it after the kids use them and they are clear so that I can see exactly what is in each one without digging through them. Told ya, total randomness. Hope you all have a good weekend! 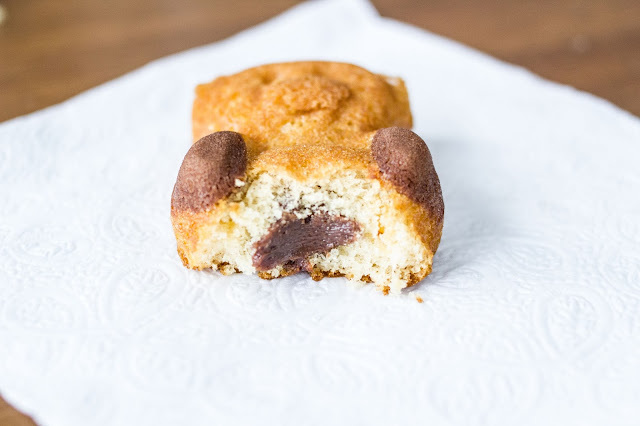 This is one of those recipes that I continually make around here and keep thinking I need to share it. But it either gets gobbled up before I can take pictures or when I do take pictures they turn out like these. Not the best. Photographing food isn't my strong suit. Give me cute active little kids all day and I can get good pictures. But when it just sits there and I have to be more creative...well.. see this posts pictures. Anyways... This recipe is delicious. 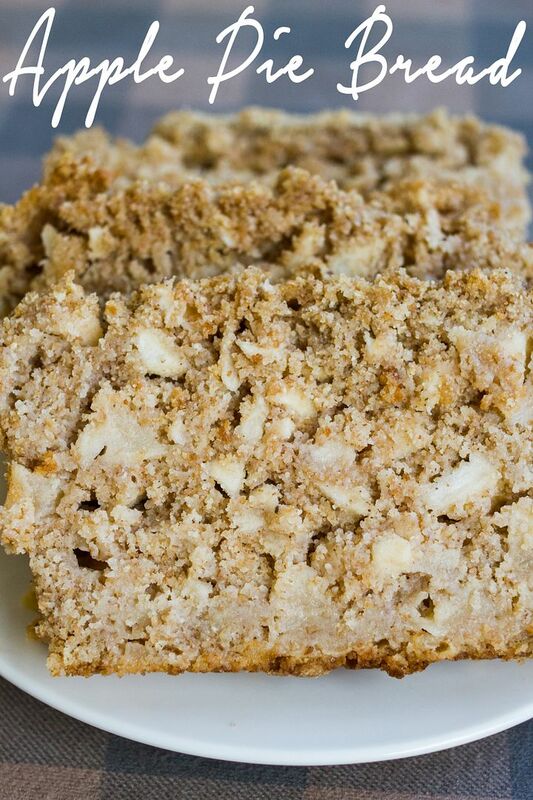 This Apple Pie Bread is full of apples. And I love the little crunch the topping adds to each bite. 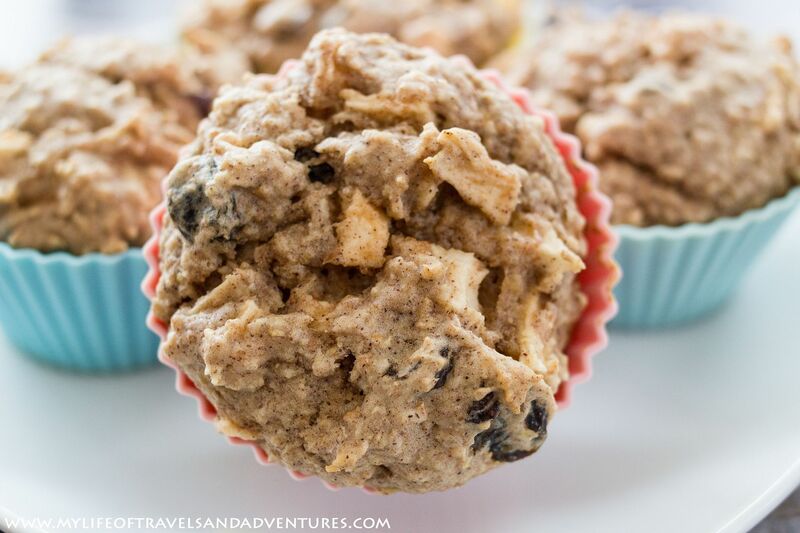 Perfect for breakfast or a late afternoon snack. 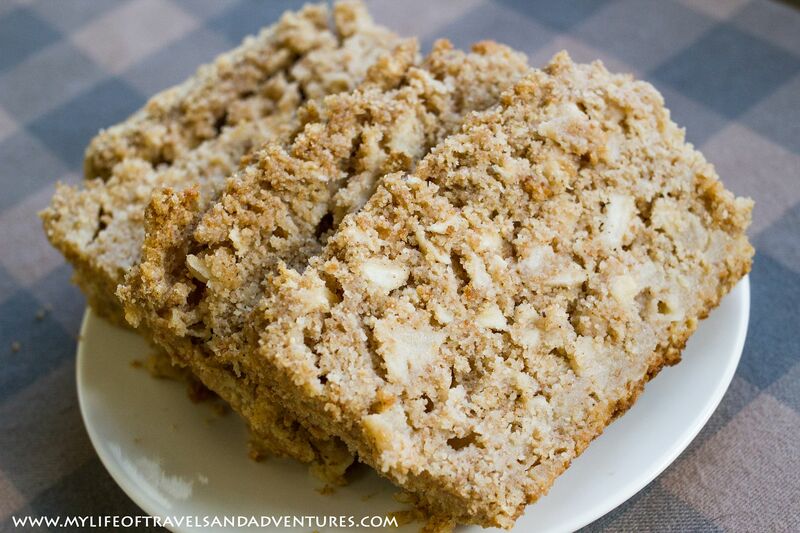 Coat a 9x5 loaf pan with non stick spray. In a large bowl, combine the butte, brown sugar, milk, eggs and vanilla. Mix until the mixture is creamy. Add the baking powder, cinnamon and nutmeg and mix. Slowly add the flour and mix until fully combined. 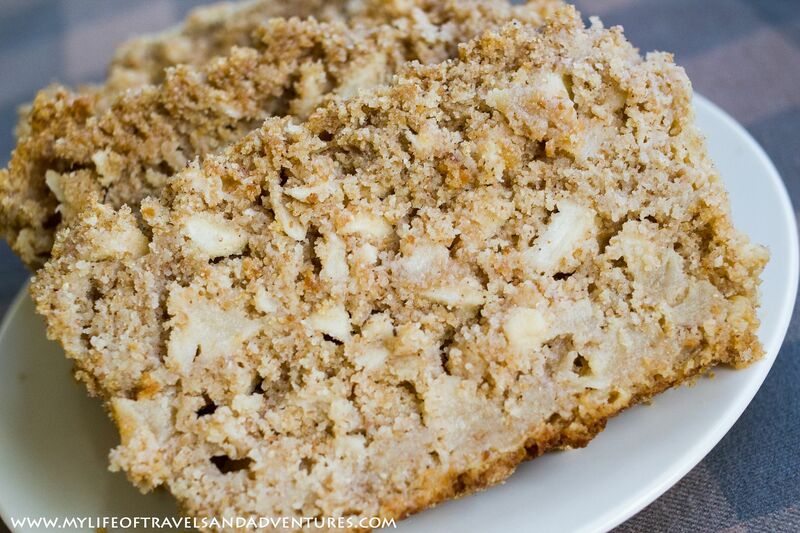 Fold in the apples and pour the mixture into the prepared loaf pan. In a small bowl, combine the 2 Tbsp melted butter, 1/4 C flour and 1/4 gown sugar. 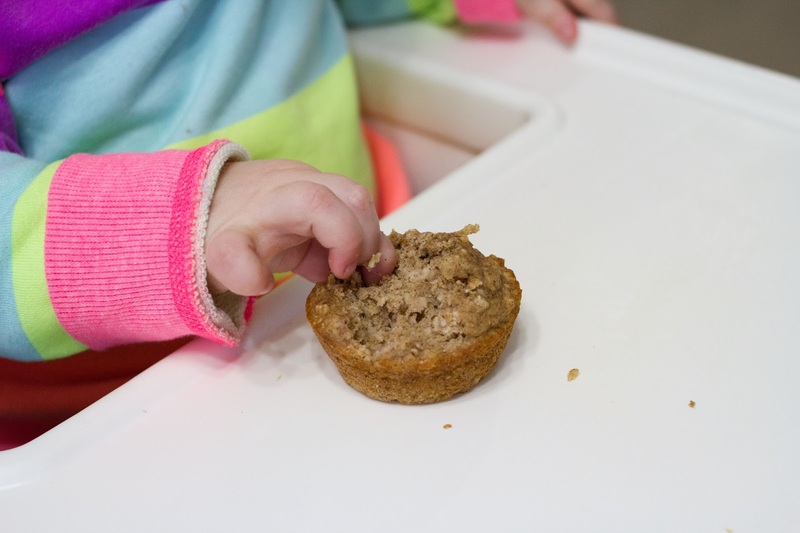 Mix with a fork until crumbly. Pour evenly over the top of the batter. Use the back of a spoon to pat the topping into the batter. This past summer was our first airplane ride as a family of four. I was a little scared leading up to vacation about the travel logistics but it worked out. 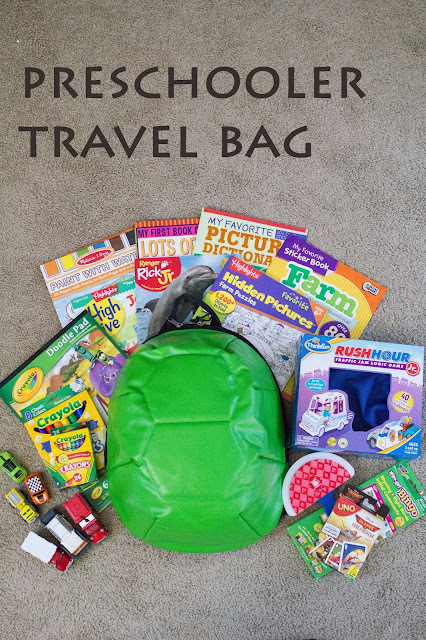 I shared before what we packed as a Toddler Travel Bag for toys and entertainment when Reid was a toddler (2.5 years old) and now I am sharing what we packed for this airplane ride (4.5 years old) and vacation. 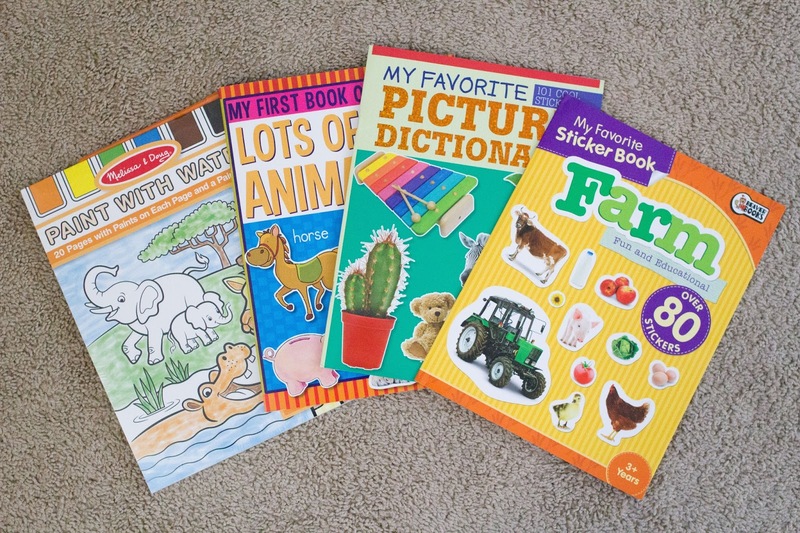 Farm Sticker Book, Picture Dictionary Sticker Book, Animal Sticker Book + Melissa & Doug Paint with Water book. 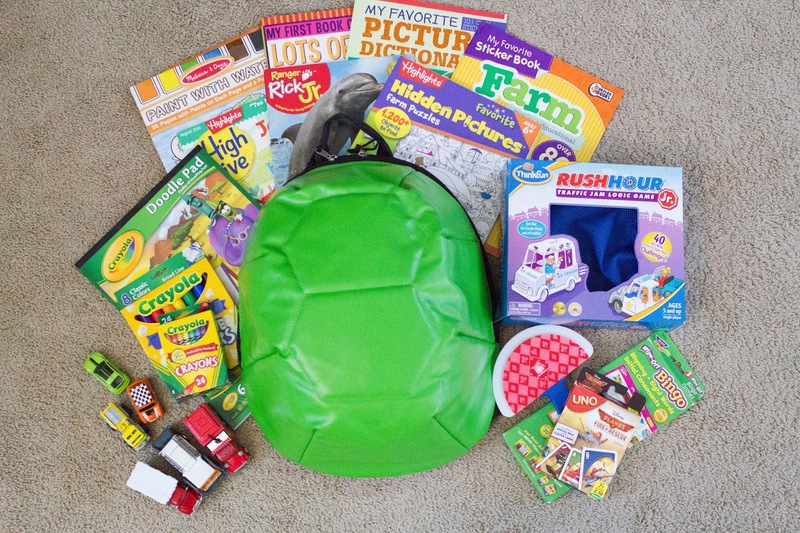 They have an entire bag of sticker that then are used on other pages as well as little activities like mazes, connect the dots, spot the differences, etc. The Melissa + Doug Paint with Water book is great, even when at home. Each page comes with a selection of paints at the top, so you just add a couple drops of water and then paint away. 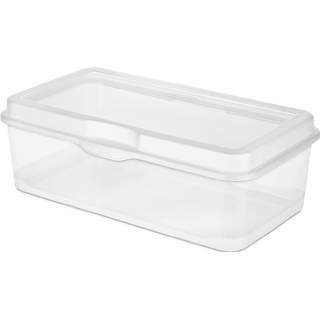 They are essentially mess free for the most part and we get tons of use out of them (waiting at a restaurant, rainy day activities, quiet time, etc). 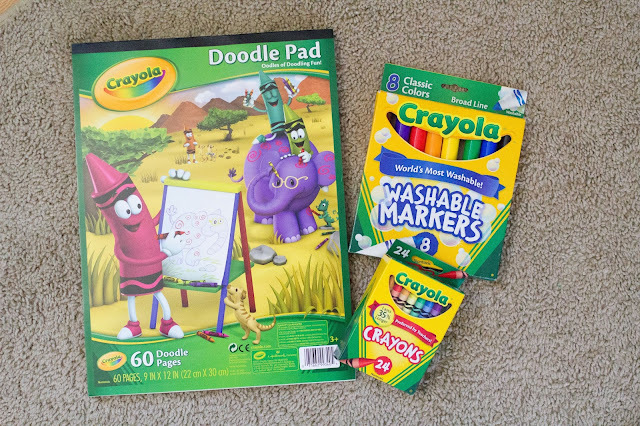 Of course we also brought A Doddle Pad, Markers and Crayons. As much as the activity books are great for keeping Reid entertained, he also loves to be creative and just draw and color. I also packed a couple small games to be played on the plane or while stuck in a hotel room. 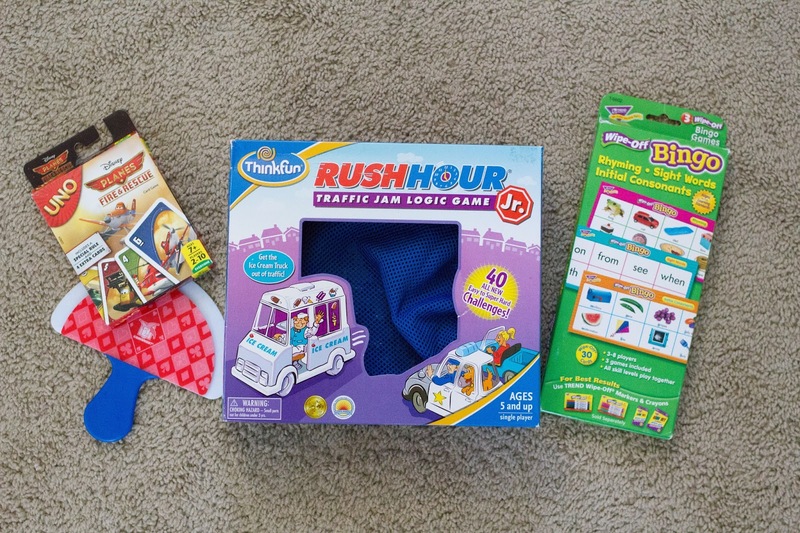 Uno, RushHour Jr and Sightword Bingo. Along with bringing Uno, I also brought our handy card holder. Reid still hasn't quite mastered how to hold cards and not show them to everyone else, so the card holder helps. RushHour Jr is great. It is a one player game, he can set it up itself. It comes with a drawstring bag so you don't lose any parts. It has varying levels of difficulty and he loves it. Sightword Bingo is a just that, bingo for rightwards. The boards are wipeable and it comes with a dry erase marker. So perfect for travel. Highlights HighFive Magazine, Ranger Rick Jr Magazine + Highlights Hidden Pictures Book. When Reid gets a new magazine in the mail he looks it over and over and over and then we read the stories over and over and over, so that by the end of the week we are both over it. But it keeps him entertained and learning. So the month leading up to vacation, I snatched his magazines from the mailbox before he saw them and saved them for the plane + hotel room. 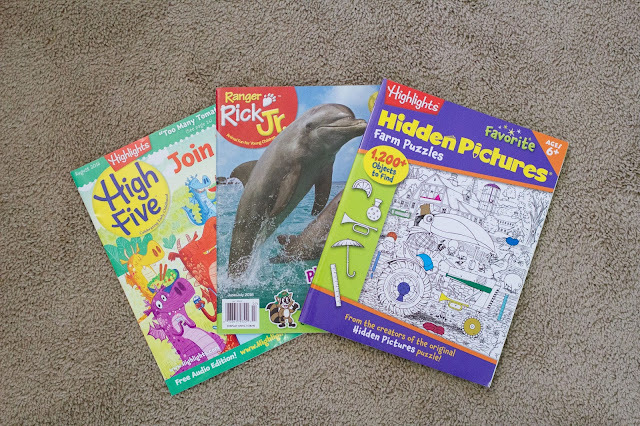 I also picked up the Hidden Pictures book because those are some of his favorite activities in his magazine. 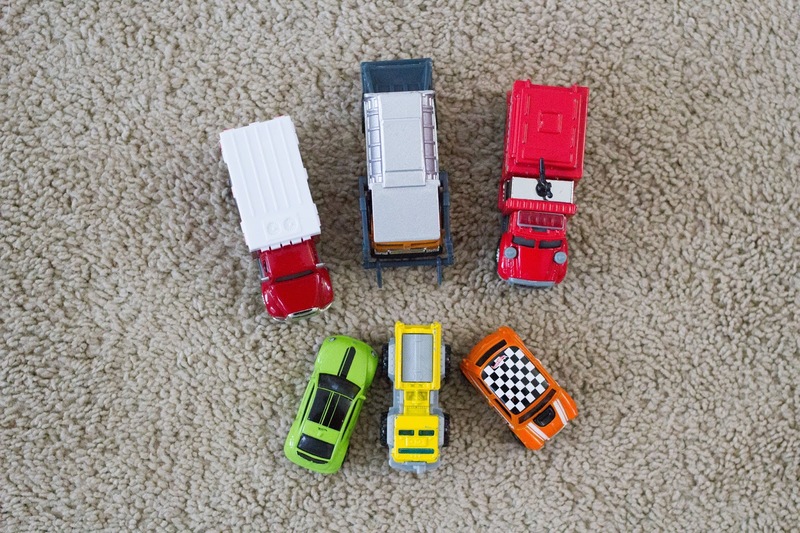 Matchbox Cars + Tonka Trucks. We let Reid pick out a half dozen little cars and trucks for the trip and as always they were a hit. So there you have it. Everything fit into his Ninja Turtle Shell Backpack and he carried it all throughout the airports. For the most part it kept him occupied all week and on both plane rides.